Stuttgart, December 2012. – A few months ago, FBW GmbH, a plastics compounding specialist in Niederzier/Germany, put into successful operation two STS 35 advanced Standard Twin Screw Compounders from Coperion GmbH, Stuttgart. Equipped with 35 mm diameter screws, these compounders have since been producing a whole range of high-grade pigment and additive masterbatches, mainly in small and medium-sized batches, i.e. in sizes ranging between 25 and 300 kg. A special service offered by the company is the production of application-specific, custom-compounded masterbatches in batch sizes upwards of 1 kg, which FBW’s customers require, for example, for new developments and pigmentation trials. Both twin screw extruders are equipped with the new STS Masterbatch die head, which can be readily opened for rapid cleaning. An easily exchangeable breaker plate permits filtering of the masterbatch melt by means of insert screens. The flow geometry has been improved in such a way that the rate of melt flow is uniform across the entire die head, thus ensuring that the individual strands emerge from the die head at the same rate – an important prerequisite for uniform strand pelletizing. 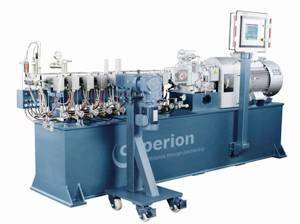 Both STS advanced compounders feature – like all twin screw extruders from Coperion – a modular design. The length of the extruder barrel, i.e. the number and type of barrel sections and screw elements, can be readily optimized for masterbatch production. Asked about FBW’s practical experience with the machines, Cornils says: “For the past eight months we have been producing a wide range of masterbatches of very good quality. Besides insisting on machines that meet our needs, we also attach great importance to a fast and competent on-the-spot service – and this we get from Coperion’s service branch in Wesseling/Germany, which is right on our doorstep.” The range of pigment masterbatches produced by FBW covers RAL and Pantone colours, special custom-compounded masterbatches and pigment masterbatches for metallic or translucent effects. The additive masterbatches are, besides lubricants and toughening agents, mainly antioxidants and UV stabilizers. For optimum compatibility with the plastics to be processed, FBW uses for its matrices not only standard polymers, such as polyethylene, polypropylene, polystyrene or acrylonitrile-butadiene-styrene copolymer but also engineering polymers that are difficult to pigment, typical examples being thermoplastic elastomers, polymethyl methacrylate or styrene methyl methacrylate. Developed at Coperion’s main production site in Stuttgart entirely in conformity with German design and quality standards, the machines of the STS advanced series are manufactured at Coperion’s production site in Nanjing/China, where CE directives are strictly observed. Thus Coperion can offer on the world market a high-performance compounding system at relatively low investment costs, enabling the user to achieve a return on investment within only a short time. Coperion’s worldwide service network, with around 350 engineers, ensures the troublefree, uninterrupted operation of all Coperion machines, no matter where they are in the world. Coperion (www.coperion.com) is the international market and technology leader in compounding systems, bulk materials handling systems and services. Coperion designs, develops, manufactures and maintains systems, machines and components for the plastics, chemicals, pharmaceutical, food and minerals industries. Within its three fields of activity – Compounding Machines, Materials Handling & Extrusion Systems and Service – Coperion has 1,900 employees and nearly 30 sales and service companies worldwide. FBW GmbH, Niederzier/Germany, develops, produces and sells masterbatches, its speciality being small to medium-sized batches. The company employs 10 people.